A mother and daughter at the Church of St. Gabriel in Marlboro, New Jersey, gave me a bible, prayer books and cards, three rosaries and holy water. They said they wanted me to remember the church where I spent Palm Sunday, after working their annual fundraiser for McDaniel Brothers Amusements. 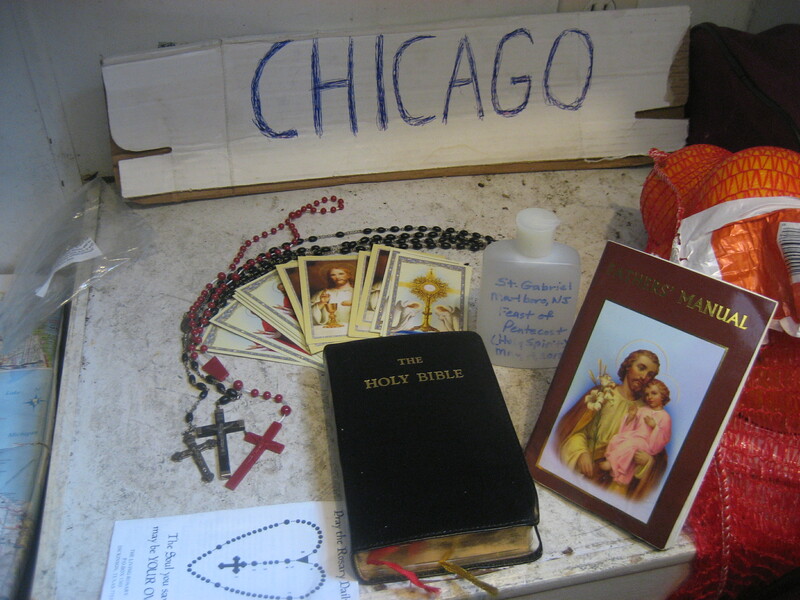 This picture was taken in Chicago, where I set up a prayer table in my bunkhouse, with the Chicago hitchhiking sign and a bag of oranges for my earthy sustenance. 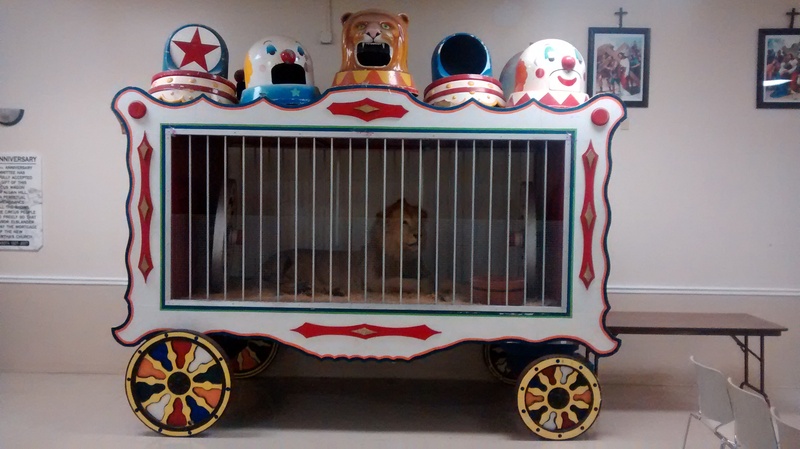 A lion in a circus wagon with trashcan art along the top of the wagon is situated at the back of the auxiliary church next to St. Martha Catholic Church, Sarasota, Florida. It is the traditional church of circus and carnival workers. The lion, long a symbol of Christian martyrdom, is in the back of the church but in front of the “stations of the cross” artwork, which depict the events leading up the crucifixion of Jesus Christ. 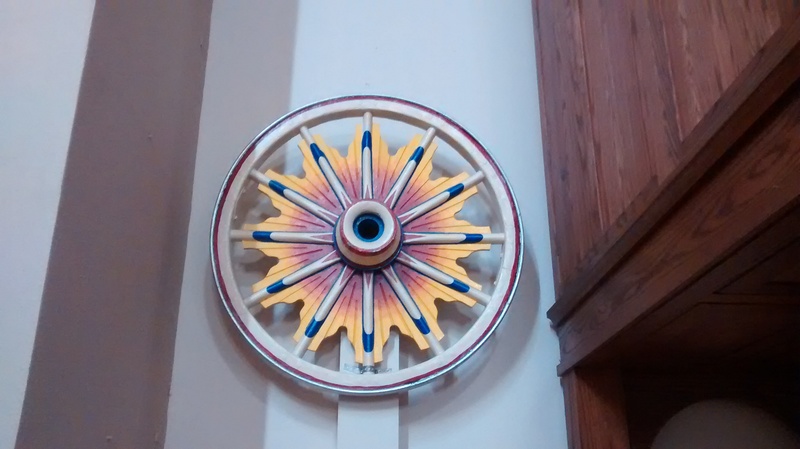 The bright, colorful wagon wheels that bookmark the altar at St. Martha Catholic Church could be mistaken for ancient religious iconography. 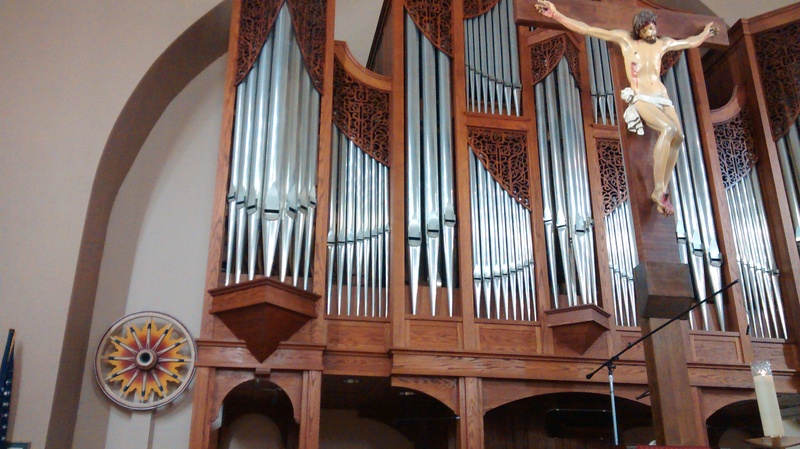 Two colorful wagon wheels bookmark the altar and organ pipes of St. Martha Catholic Church. The origins of the crucifix with Jesus is uncertain but came from the artwork studios of the Ringling College of Art and Design. 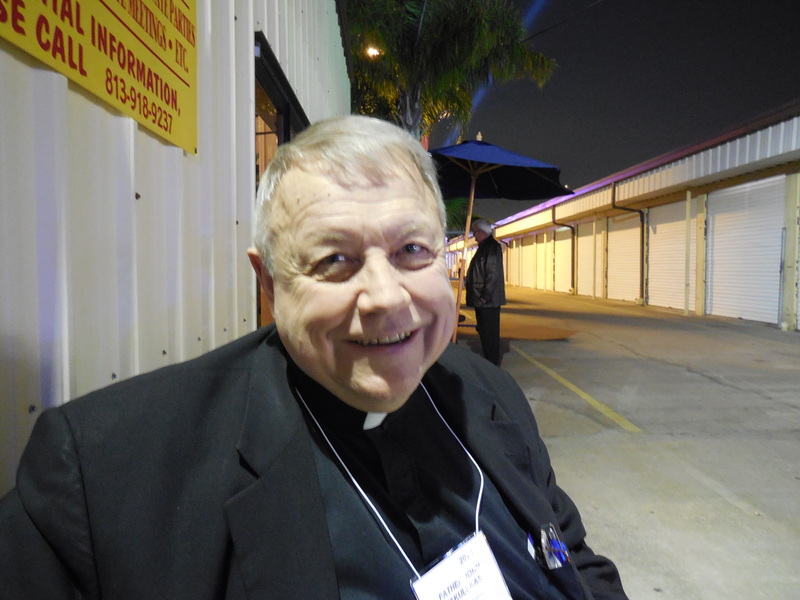 Father John Vakulskas of Iowa, shown here at the national convention of traveling carnivals in Gibsonton, Florida, is taking up the role as the carny priest from the legendary “Father Mac,” Msgr. Robert McCarthy of New York. They are part of a traveling apostolate appointed by the Pope to minister to the traveling people of carnivals. 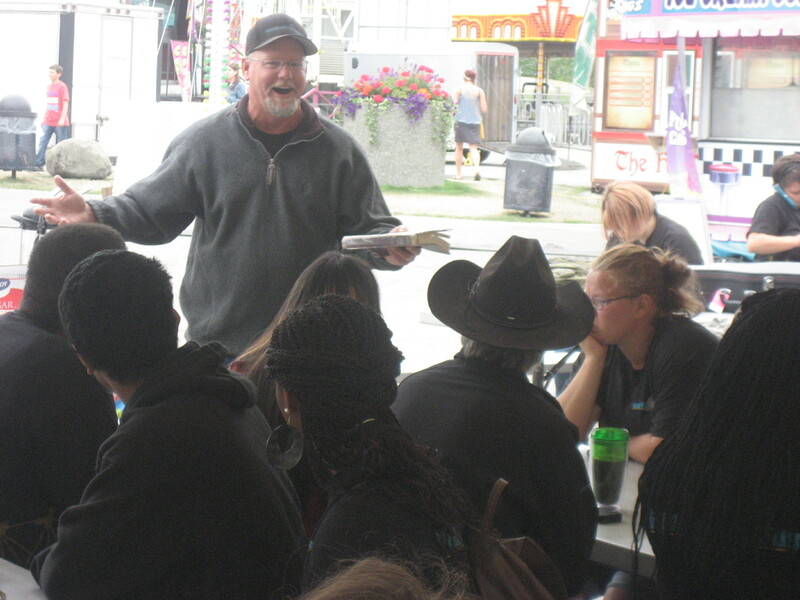 “Carny Preacher” Bill Root gives a sermon to carnies before the opening of the Bear Paw Festival, Eagle River, Alaska. Root was also the head of games at Golden Wheel Amusements, Alaska’s only traveling carnival. Golden Wheel is owned by born-again Christians and holds prayer meetings and services on carnival grounds for carnies.